Seriously? OMG! 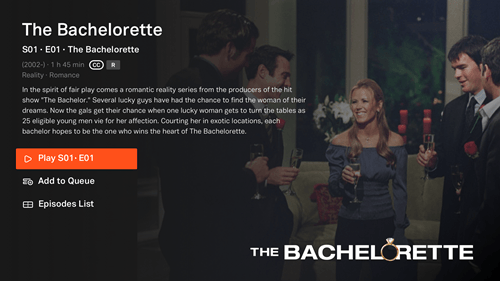 WTF?The Bachelor Archives - Seriously? OMG! WTF? About a year ago, my friend Paulette told me about a streaming site called Tubi TV. Since then, I have watched a movie or a TV show on it every day since, and there are still many more options for me to choose from. I have rarely ever watched anything twice. I have cried, laughed screamed several times thanks to their vast supply of movies. And did I mention it is FREE? There are 1,000s of movies: horror, action, comedy, classics, cult classic, award-winning, faith, African-American cinema and so on. They also have shows and films to occupy babies and toddlers’ attention with. There is something for everyone. Even during Christmas, they had a wide selection of features to choose from. After I watched around a dozen horror movies about the holiday, I got my share of Lifetime, Hallmark and faith-based telemovies in. Since I need to sleep with the television on, I sleep with Tubi TV on my aging iPad. After a program finishes, they automatically go to another one on their library. I never know what I am going to wake up to, and I look forward to the surprise. Another surprise I love about Tubi TV is that they have rare standup specials, concert performances and exercise videos. Like I said there is something for everyone. and season 5 of Bachelor in Paradise. If that is not enough, they will also be streaming Donnie Darko, Down to Earth, The Virgin Suicide, Species II, Indecent Proposal, Bill & Ted’s Bogus Journey. Those are just a few of the many, many, many titles. Another thing I use Tubi for is when someone dies, like Luke Perry, I search to see if they have anything by that person. Which they will and then I will watch it. You can never get bored with Tubi TV. Plus, you can’t beat the price, FREE! On November 18th, Rebekah Martinez’s mother reported her daughter missing because she had not heard from her in almost a week. A month later, the mom told Humboldt County Sheriff’s Office that she spoke to her daughter and all was OK. But according to CBS News, since they did not talk to her directly, she was still considered missing. Then on Thursday, Rebekkah’s photo was in a SF paper and listed as missing. But a woman had just seen her earlier in the week and called the authorities to tell them that she was found. Where was she? On ABC’s The Bachelor. Where was she when her mom reported her missing? The 22-year-old was working on a marijuana farm. I wonder if she told Arie Luyendyk Jr that? Because I am sure that would make him like her more and keep giving her roses. BTW Bekkah has a good sense of humor about this all. She Tweeted, “MOM. how many times do I have to tell you I don’t get cell service on The Bachelor? ?” The morale of the story suddenly goes missing, make sure to watch all the reality shows to see if they are on one of them and cannot communicate with you. Could Chris Harrison be the next Bachelor? The Bachelor’s Executive Producer Mike Fleiss spent yesterday asking fans on Twitter who the next Bachelor should be and he sent out a surprising name. He Tweeted, “Yes, @chrisbharrison ‘s name is on the board. It’s a long shot, tho…” And as soon as you were done trying to figure out how he was going to host the show and be the rose giver, Fleiss broke some bad news. He told us, “Just heard from @chrisbharrison. Unfortunately, he is no longer a candidate to be #thebachelor…” No rose for you Mr Fleiss. Now that we know who is not going to be the next Bachelor, who do you want it to be? I am rooting for DeMario Jackson because he already has a reputation that makes Nick Viall look boring. Too bad they could not figure this out a month ago, so that he could have given Bachelor in Paradise another shot. He is what that show has been missing. When it comes to Nick, stop trying to find love on TV and look for it in real life. And don’t sleep with the bridesmaids after the wedding and dump them by breakfast. Try to get to know her first. Strange concept, I know! UPDATE: If you are wondering why they split, besides meeting on a TV show, Eonline says that it was the distance that came between them. He is residing in Los Angeles and she lives in Montreal. Neither was willing to move and it is hard to keep a relationship going if you are in two different countries. Maybe ABC should pick people who live in same general area because this is always going to be a problem. It has happened before and it will happen again.